2017 UW-Madison Excellence in Research Award. "We have known Roger Brown for approximately two years. In our faculty research role, we often need to consult with biostatisticians to provide consultation and advice related to various components of research grant proposals, such as research design, variable selection and measurement, sampling schemes, sample size determination, and data analysis. Roger was recommended very highly to both of us by others on campus who work with him. Both of us recently consulted with Roger on three federal grant proposals. Researchers tend to be a bit anxious when consulting with statisticians. The anxiety comes from the fact that you need to communicate specific aims for a project and the background for the aims to the statistician who may not be familiar with the topic area. Further, you need to communicate the research design, variables, sampling ideas, and outline the data analysis. A major source of anxiety is learning from the statistician that what you are proposing to do is not appropriate or simply will not work. We can say confidently that we have never felt this way talking with Roger about our research proposals. 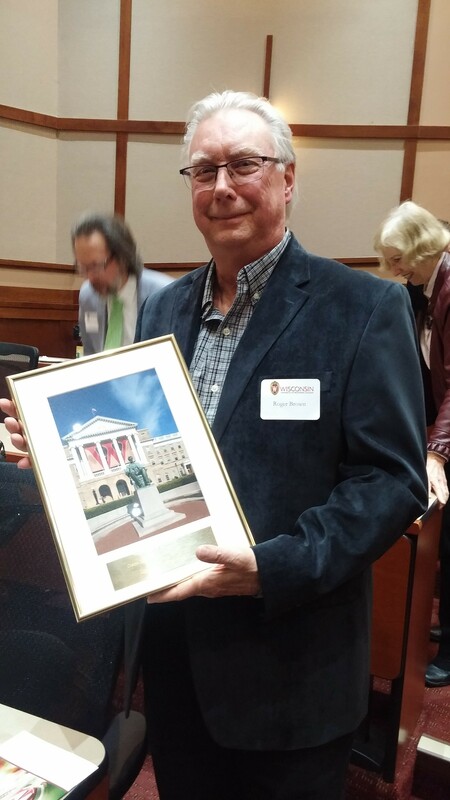 Roger Brown is exceptional in his role of supporting research at UW-Madison. Roger Brown is exceptional for many reasons. First, he has an uncanny way of making you feel comfortable the minute you walk into his office. He is a very warm, genuine person who is always willing to talk with you about your research. Second, he is a good listener, and a true expert. We combined these two characteristics because we can honestly say that Roger knows exactly the right question to ask when he is trying to understand what you are proposing to do. He listens to the initial description, asks the right questions, and carefully listens to the answers. This cycle on listening and asking the perfect question continues until he understands. We really appreciate his ability to cut right to the key points of a study and ask the key question to clarify and improve the project. His expertise is exemplified in the suggestions he makes for the proposals that always make them better. We really appreciate that we have access to his expertise, creativity, and experience. Third, Roger is very giving of his time. We appreciate very much his patience and his willingness to answer questions, provide advice, and provide text for a grant proposal usually under very short time lines. Because of his expertise and experience, he can anticipate when these short time-line situations are coming and what the subject of the situations will be. He always delivers the exact thing that is needed or delivers a component that will improve the project." “To begin, I can say without hesitation that Roger Brown is one of the very smartest, hardest-working, and most capable people that I have ever worked with, .... As background, I am a tenured research Professor and practicing family physician in the Department of Family Medicine and Community Health. Since coming on faculty in year 2000, I have brought in over $10 million in research grants, mostly from the NIH, and have >80 peer-reviewed publications on my CV, the majority first-authored. As such, I have had the privilege of working with quite a few very smart and highly accomplished people here at UW-Madison. Of the many collegial relationships that have helped me on my path, I can say without hesitation that Dr Brown’s support has been the most important to my success. Roger’s input has been crucial in designing research studies, and especially in terms of selecting the best analytic approach, as well as carrying out the statistical evaluation. "Dr. Brown is a tremendous research collaborator and has provided critical research support to my colleagues and me at the Center for Quality and Productivity Improvement in the College of Engineering. Dr. Brown has provided his expertise in statistics and research design to multiple proposals, projects and publications. He has been a key member of several of my projects. For instance, he was a co-PI on a project funded by the National Science Foundation to study the work of nurses working in remote intensive care units (also known as tele-ICUs). In this project, Dr. Brown provided unique expertise on multi-level modeling to model and assess the factors that affect tele-ICU nurses’ trust and perceptions toward the ICUs that they monitor. The major paper of this project has recently been accepted for publication in the Journal of Critical Care (“Virtual collaboration, satisfaction and trust between nurses in the tele-ICU and ICUs: Results of a multi-level analysis”). This analysis was a major effort given the complexity of the relationships between tele-ICUs and ICUs; Dr. Brown applied innovative multi-level modeling techniques to this complex analysis. Dr. Brown has made significant positive impact on research in my discipline of human factors engineering and its application to health care. A few years ago, Dr. Brown collaborated with my colleague, Professor Bentzi Karsh (Bentzi passed away 4 years ago); they proposed a hierarchical multi-level model of patient safety. This research was first presented at the 2005 conference on Organizational Design and Management. Dr. Brown and Professor Karsh then published their formal paper on “Macroergonomics and patient safety: The impact of levels on theory, measurement, analysis and intervention in patient safety research” in Applied Ergonomics, one of the three top journals in my discipline of human factors and ergonomics. A PhD student of Professor Karsh, Richard Holden, and Professor Patrick Waterson of Loughborough University in the UK built on this work and published a major paper on “Crossing levels in systems ergonomics: A framework to support ‘mesoergonomic’ inquiry” in Applied Ergonomics in 2014. This is an example of how Dr. Brown has gone beyond providing research support, and made major scholarly impact in my scientific discipline. When I face a complex research problem, I often turn to Dr. Brown for feedback, suggestions and advice. I know that I can rely on his technical expertise. His technical expertise in statistics and research design is exceptional. Many of my proposals would not have been funded without his contribution. Dr. Brown has been a key member of most of my research proposals in the past 15 years. The contributions of Dr. Brown go beyond his technical contributions; he just an amazing research collaborator. He is very open to new ideas and approaches; he does not shy away from complexity and ‘messy’ data that come with analyzing complex systems. Dr. Brown has contributed to the training of many faculty, researchers and graduate students. For instance, a few years when we started to assess multi-level complex systems, Dr. Brown gave a series of seminars to CQPI. Dr. Brown has participated in several committees of my PhD students. The most recent was the PhD dissertation of Yaqiong Li on “Designing Health IT for Teamwork: A Human Factors Study of Hospital Bedside Rounds”. Dr. Brown spent a lot of time with Yaqiong and provided significant support in the design of her data collection as well as the data analysis. Dr. Brown is always available to help with graduate students. A few years ago, he organized a special course on research design that all of my graduate students took. Dr. Brown is very committed to sharing his knowledge and expertise with faculty, researchers and students." "I highly recommend Dr. Brown as a consultant for biomedical researchers. He has considerable expertise in the areas of study design and statistical analysis, especially in the area of practice based research, and is very responsive to the priorities and goals of the investigator." Dr. David Katz, Assistant Professor of Medicine, University of Iowa Medical School. "Dr. Brown has enormous expertise and skill in the appropriateness and use of the most current analytical methods, and a wealth of experience in working in the areas of health and mental health services research." Professor Mary Ann Test, School of Social Work, University of Wisconsin-Madison. "During the past several years Roger Brown, Ph.D. has provided statistical support for two clinical research projects that I have headed. Dr. Brown provided these services on a volunteer basis. The first project was a survey study looking at the demographics of primary care sports medicine physicians in the United States. Dr. Brown was instrumental in helping me develop survey questions that could provide meaningful and clear clinical answers. Once the data was collected, I was impressed with his diligence and expertise in completing the statistical analyses. On several occasions I needed more statistical information on short notice which was never a problem. I also found Dr. Brown to be readily available for questions. The second research project involved a more complex clinical study requiring a number of statistical analyses for which Dr. Brown was again invaluable, both in terms of selecting the best statistical approaches to interpret the data as well as accuracy in completing the analyses. After the study was submitted for publication, he willingly responded to the comments that the reviewers of the journal requested. In summary, I found Dr. Brown extremely knowledgeable, responsive, accessible, and friendly to work with. I would look forward to collaborating with him on future research projects, and would also highly recommend him to others." Dr. Douglas F. Hoffman, Director of Sports Medicine, Physicians Plus Medical Group, Madison, Wisconsin. "Dr. Brown is an unusual blend of the highly academic and the eminently practical. He is on the cutting edge of statistical theory and practice, yet able to provide extremely useful guidance on the mundane details that can make or break projects." Dr. Richard Brown, Associate Professor, Department of Family Medicine, University of Wisconsin Medical School. "Dr. Brown will contribute a solid knowledge of research methods and up to date statistical techniques to any group that wants to develop a grant proposal, plan a research study, or initiate a program of research development." Dr. Mary Beth Plane, Senior Scientist and Coordinator of Research, Department of Family Medicine, University of Wisconsin-Madison. "I have worked closely with Dr. Brown in grant writing, research, statistical analysis and teaching for over 6 years. He is considered a national expert in statistics and has been a large part of my research team's success." Dr. Partick McBride, Dean of Students, University of Wisconsin-Madison, Medical School and Director of Preventive Cardiology, University of Wisconsin-Madison Medical School. "As a co-investigator on two research grants, beginning approximately 5 years ago, Dr. Brown has contributed to the development of the research design and planned and given oversight to the analysis of the data. Dr. Brown is exceptionally sensitive to the contingencies of clinical research in designing a research plan, and is highly innovative in the data analytic strategies that he creates. He uses state-of-the-art data analytic strategies, and is continually seeking new strategies to solve data analytic problems. He is a superb consultant in all respects--quickly grasping the research problem, carefully explaining details of a complex analysis strategy, and efficiently executing the data analysis in a timely manner." Professor Karen Pridham, University of Wisconsin-Madison, School of Nursing. "Dr. Brown is a highly respected and nationally know for being at the forefront in the development and application of cutting edge statistical techniques. I owe my success in securing funding of two NIMH proposals to the excellent consultation and assistance Dr. Brown provided in helping formulate the study design and statistical analyses." Associate Professor Jan Greenberg, School of Social Work, University of Wisconsin. "Dr Roger Brown provides a comprehensive service for any medical researcher needing statistical analysis. He assisits the researcher from the initial planning stage to the final outcome,and explains stastistical concepts in simple terms that can be understood by less-statistically-minded mortals! Alhough this study was done in South Africa,all statistical analysis was done by Dr Brown via e-mail correspondence.He is willing to discuss any queries in a prompt and friendly manner,making the writing up of the results he obtained easier to integrate into the final report. I can highly recommend him." Dr Louise Matthews,M.D.,Principal Medical Officer and PhD student,Department of Obstetrics and Gynaecology,University of Cape Town,South Africa. "Dr. Brown's assistance in developing power analyses and statistical models for several major research grant applications has been invaluable. His work has been highly praised in peer reviews of our proposals, and has been instrumental in our obtaining funding. During the actual conduct of the projects, he is able to convey complex statistical concepts in an understandable manner and assist project staff in making difficult design, analysis and interpretation decisions. I highly recommend his services." Dr. D. Paul Moberg, Director and Senior Scientist, University of Wisconsin Center for Health Policy and Program Evaluation. For more endorsements, please contact Medical Research Consulting.